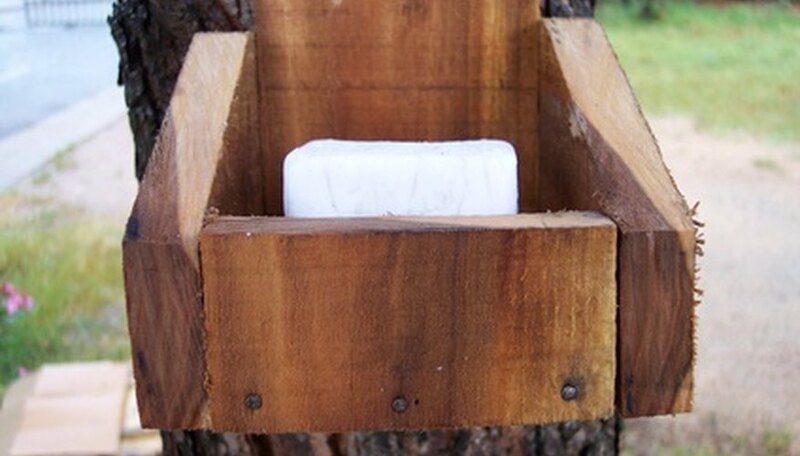 Soap was an important commodity for personal hygiene and cleaning clothes during pioneer days. But buying soap often meant a journey of several hours to the nearest village, which would take away time from more important chores such as farming, mending and cooking. Making soap was the alternative. The process was hot, smelly and labor-intensive, so soap was made in large batches and meant to last for long periods. Don the protective eye wear and rubber gloves. Mix 3/4 of a pint of water with half of the lye in a bowl made of a material that won’t corrode, such as stainless steel. Aluminum pots will be ruined by lye. Take the tallow off the stove. Pour the lye slowly into the tallow and stir at a steady pace for about 15 minutes. It should have the consistency of syrup; if there are too many lumps, put the pot on low heat until it softens. Pour the mixture into a container lined with wax paper. Let it harden for 24 hours, then cut into soap bars. Allow three to four weeks for the bars to cure before using them. Lye is extremely caustic and dangerous. In addition to the protective gear, do not breathe in the fumes of the cooking soap.